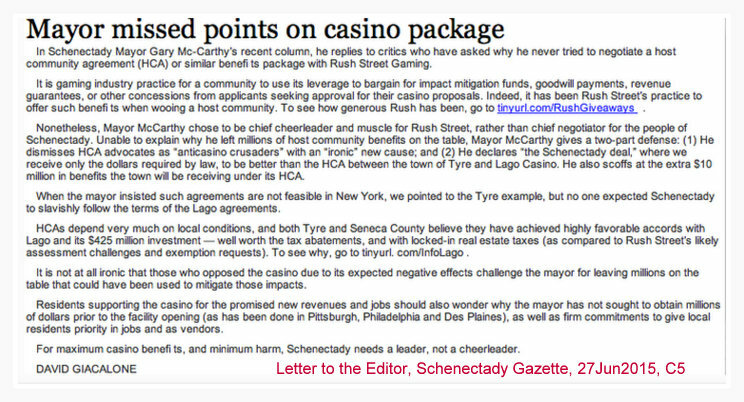 In his June 19th Guest Column in the Schenectady Gazette, Schenectady Mayor Gary McCarthy attempts to answer critics who have asked why he never tried to negotiate a “host community agreement” [“HCA”] or similar benefits package with Rush Street Gaming [“Rush Street”]. 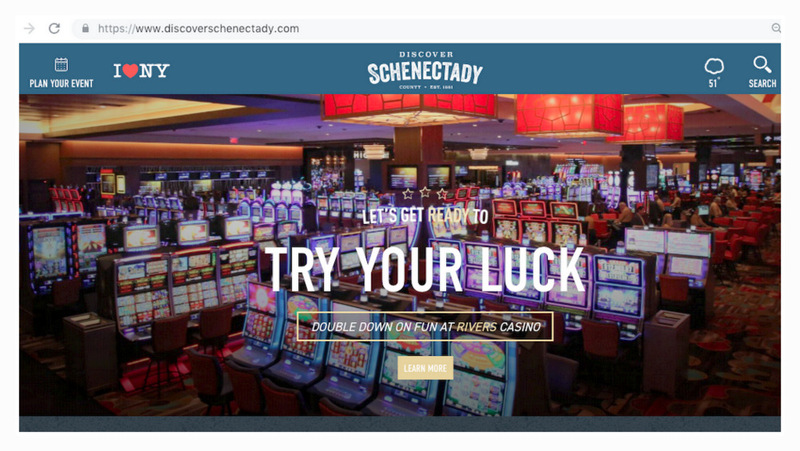 (Guest Column, “Mayor: Schenectady casino deal better than Seneca host package“, June 12, 2015, C8, pdf. 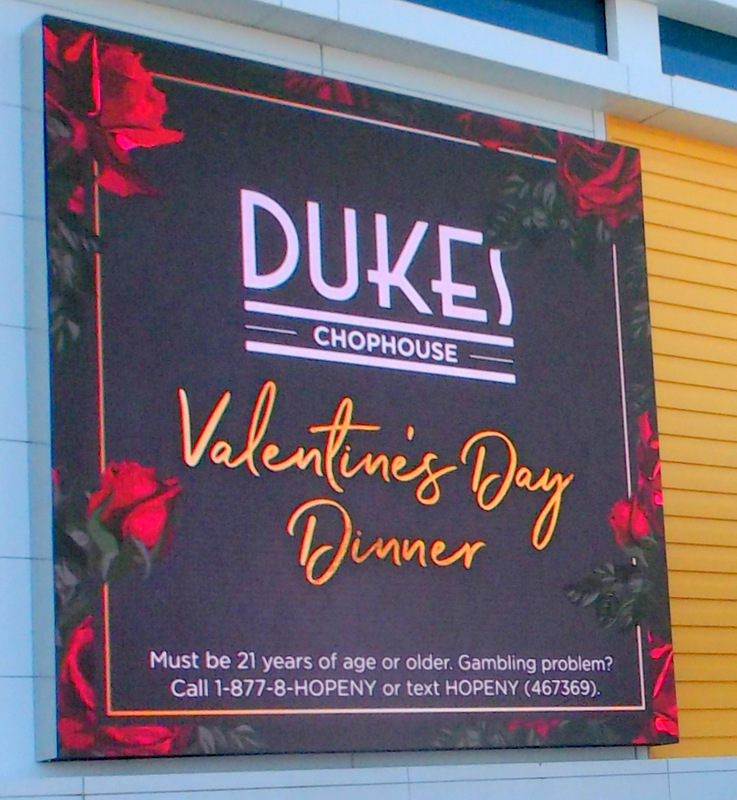 file) The issue was first raised at this website in late April, in the posting “Mayor McCarthy left millions on the casino table“, with follow-up postings on May 18th, “Money on the Table, Part 2“, and May 27th, “Rush Street’s Giveaways“. Schenectady resident and business owner Mohamed Hafez, asked the Mayor directly about host community agreements at a City Council meeting on May 11th, and at subsequent meetings. 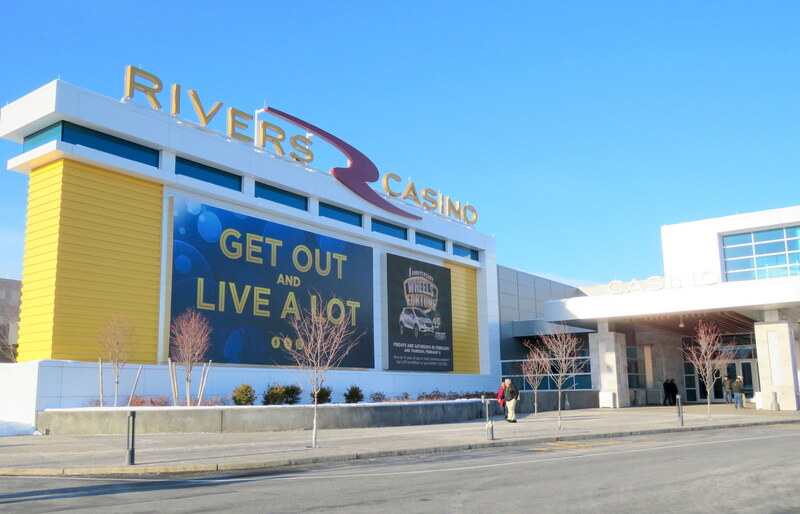 Mayor McCarthy wrote in the resulting Gazette Guest Column that the casino deal Schenectady has with Rush Street Gaming is superior to the Lago-Tyre Host Community Agreement. 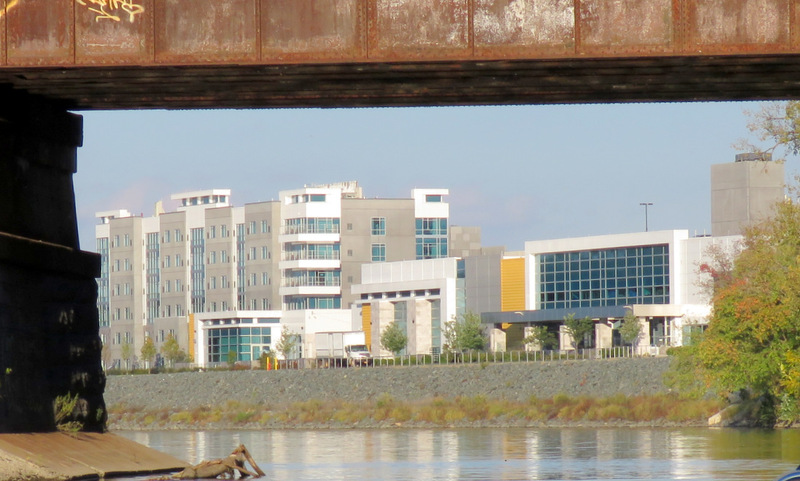 The Mayor compares select figures from the Lago HCA and the Tax Accord between Lago and the Seneca County Industrial Development Agency (IDA) and declares the “Schenectady deal” (there is no agreement) to be better. 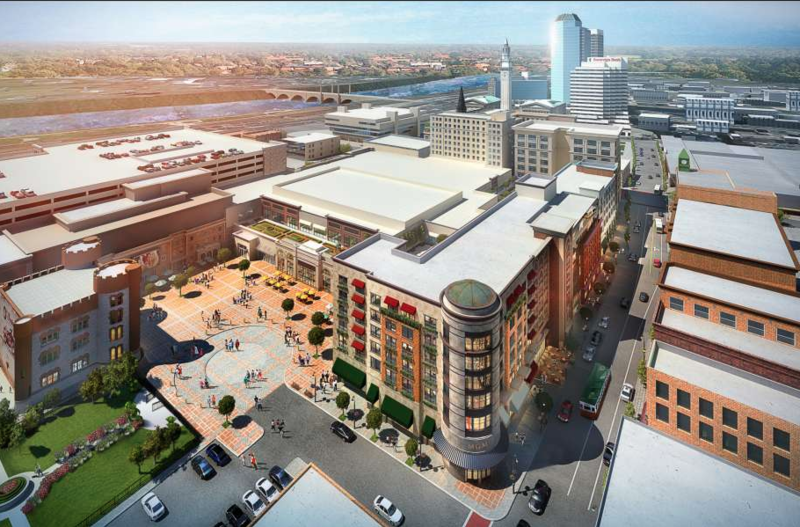 That is apparently because Lago received tax incentives/abatements not granted by Schenectady or Schenectady County to Rush Street, and the projected annual share of gaming tax revenue for the City of Schenectady, $4.1 million, is larger than the estimate of $3.9 million for Tyre/Lago. Comparing individual, selected pairs of numbers from Seneca County and Schenectady proves little when Schenectady, with a population of 66,000, has nearly 70 times more residents than Tyre, and Seneca County, at 35,000 residents, has less than a quarter of the population of our County. The important point is that both the Town and the County IDA decided to do their homework (i.e., learn what potential host communities have done elsewhere and what the Town’s legal rights are, while commissioning a study to identify likely impacts, and quantify costs and benefits), and then to actively negotiate with their suitors. 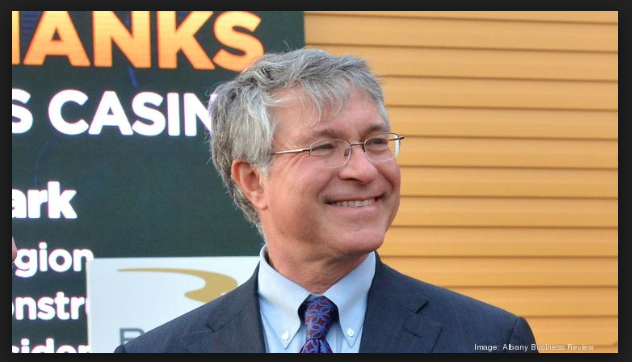 As a result, they each believe they have negotiated very favorable terms with Lago. 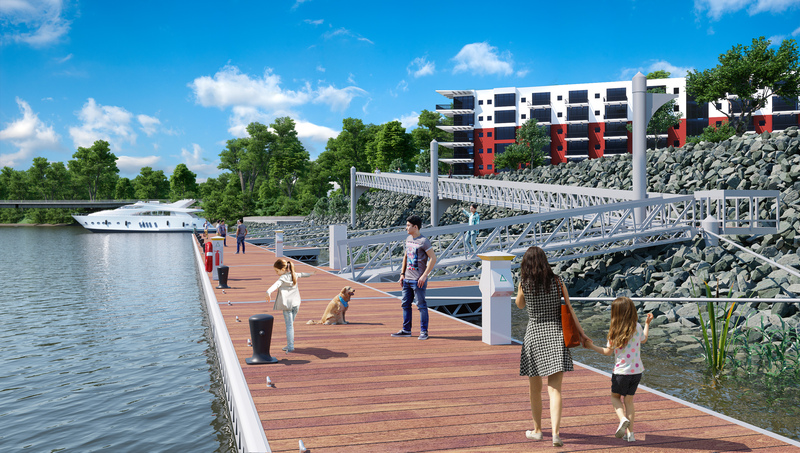 For example, Wilmorite is investing $425M at Tyre (40% more than Rush’s plans at Mohawk Harbor); the jobs it brings will cut the County’s unemployment rate significantly more than similar numbers of employees could do here; and the sales taxes generated due to Lago’s construction and operation will be significantly more than the annual sales tax abatement it has been offered. Seneca County will also receive payments during the period of its IDA accord with Lago that will offset the mortgage tax abatement granted to Wilmorite. 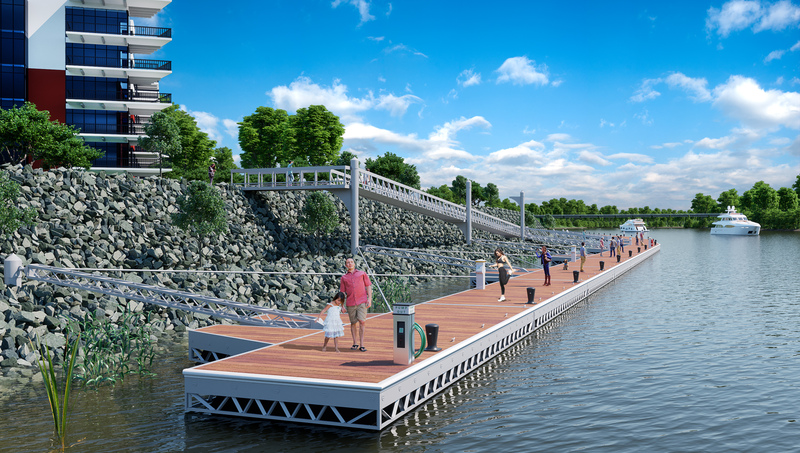 The IDA’s Lago Cost/Benefit Analysis concluded that the benefits from Lago for the County will be 51 times greater than its costs (including tax abatements), without counting the enormous benefits of the largest construction project in the County’s history. 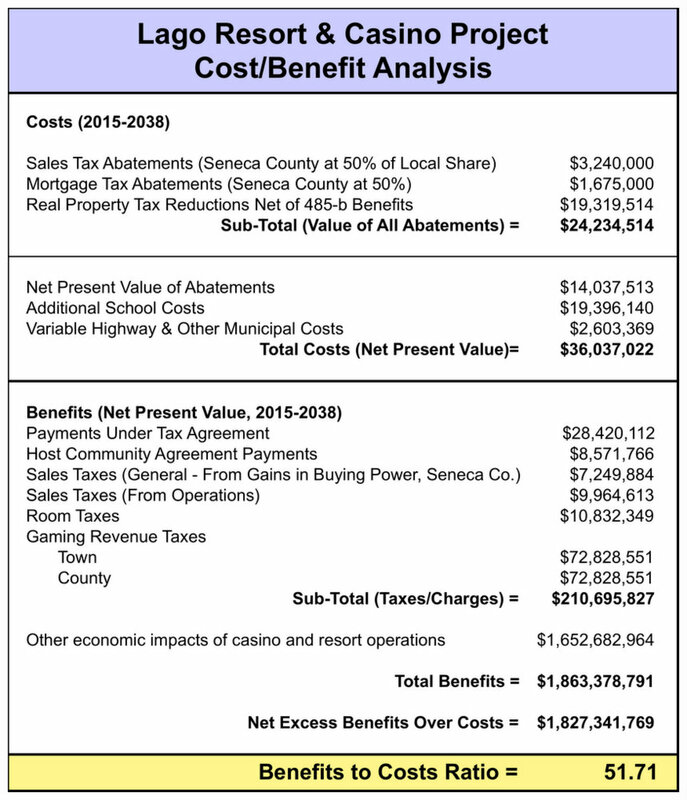 [summary chart at left; click on image to enlarge] And, Tyre, by the way, is expecting about $4000 in annual gaming revenues per resident, whereas Schenectady’s share of gaming revenues will be about $62 per resident. Moreover, the millions in extra mitigation payments by Lago that are scoffed at by Mayor McCarthy will be about $500 per Tyre resident per year, while Schenectady won’t be getting one cent. A study commissioned by the IDA estimates the project will have a $1.8 billion economic impact in Seneca County. 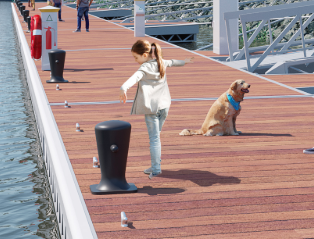 The project would also generate $45.3 million in payments to Seneca County; the Waterloo Central School District; infrastructure improvements; and more over 20 years. As part of the proposed agreement, Seneca County would receive $3.83 million more than it would have expected to receive thanks to efforts by the joint IDA and County project advisory committee. This level of payment would exceed the level that would be projected to be paid under the already available New York State statutory 485-b property tax exemption program that this project would qualify for. For nearly 40 years, New York State has offered this 50 percent property tax exemption to businesses that invest $10,000 or more per year on building enhancements. All of this is in addition to the Host Community Agreement with the Town of Tyre that will generate a projected $10.5 million in payments over 20 years to provide additional services such as fire, ambulance, and sheriff. This said, Wilmorite has applied for a tax agreement covering sales, mortgage and property taxes. 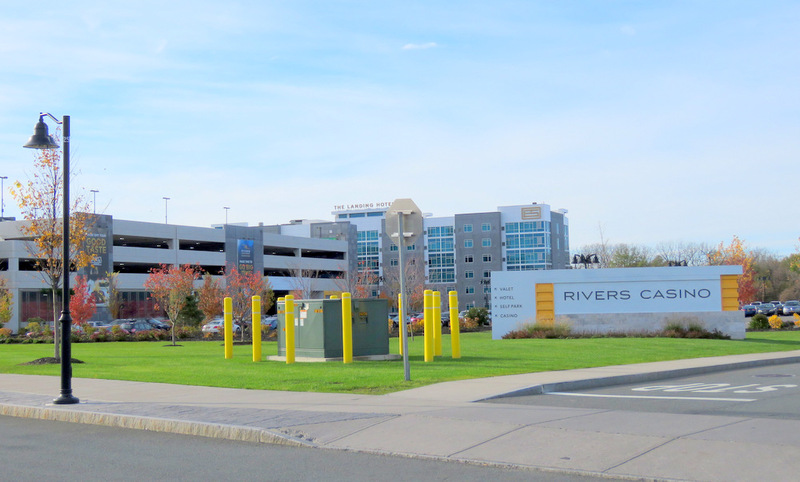 These include $16 million in New York State, regional and local sales tax exemptions, and $3.35 million in New York State and Seneca County mortgage tax exemptions. As part of the accord, the developer has committed to purchasing construction materials and supplies from Seneca County vendors whenever possible, offsetting the local sales tax exemption. In addition, as part of the accord, Seneca County would receive payments in future years, offsetting the mortgage tax exemption. 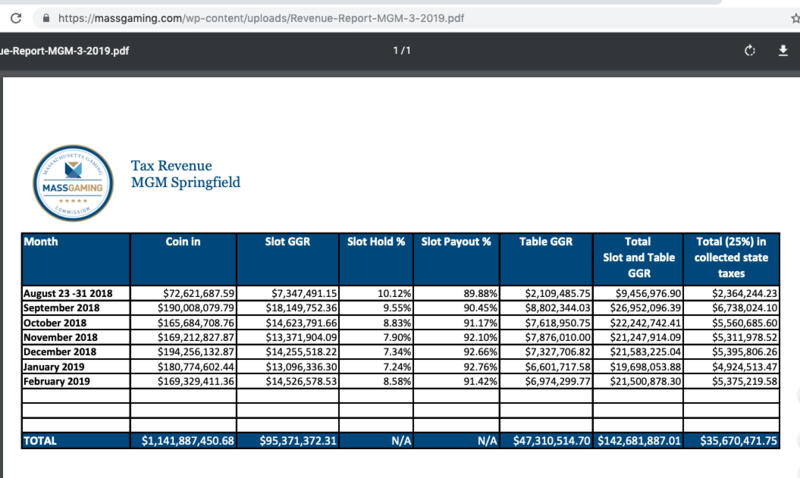 For the reader’s convenience, we are repeating below our lengthy discussion, from the earlier posting “Money on the Table, Part 2“, of the Host Community Agreement between the Lago Casino and the Town of Tyre. Lago at Tyre. 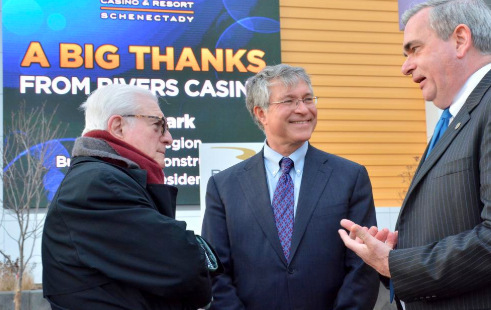 More telling than Albany’s efforts to obtain a community host agreement is what happened with the Lago Casino & Resort in the Town of Tyre, a tiny agricultural community in Seneca County, NY, which was the eventual “winner” in the Finger Lakes Region. Although Tyre has a population below one thousand, its leaders had a thoughtful and thorough response when they learned that the Wilmorite Corp. [also known as Wilmot] wanted to put a casino on a parcel within the Town. 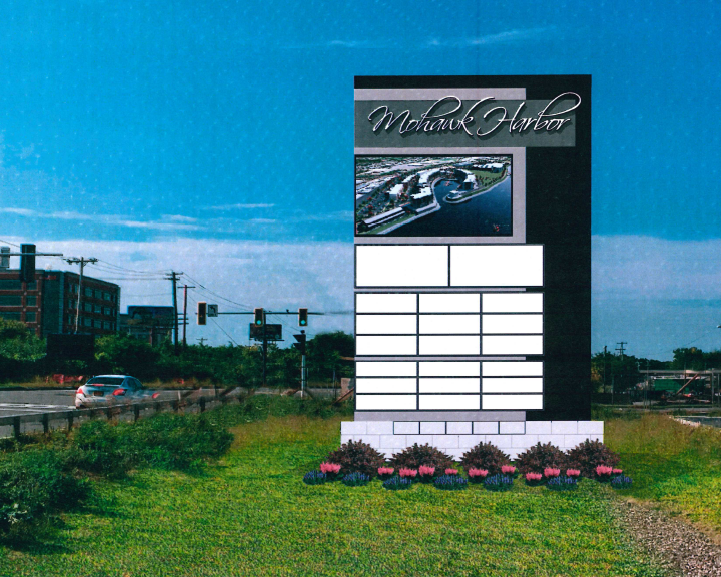 Beyond getting itself good legal advice and keeping its residents fully informed and involved, the Town commissioned the study “Impacts of Wilmot Casino on the Primary Impact Area: Emphasis on Socioeconomic & Public Safety” (June 2014, 44-pages), which was prepared by the Center for Governmental Research, in Rochester, NY. 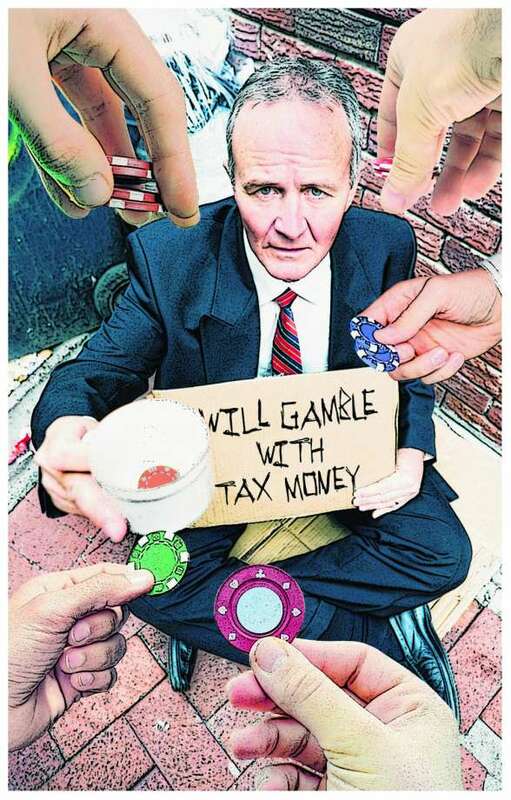 Tyre also requested Cornell University to review and summarize a compilation of Canadian studies on the impact of casinos, especially problem gambling.